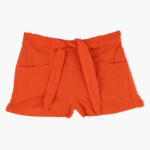 Bring out the stylish side of your little girl by getting her these alluring shorts. Displaying a textured look, these shorts sport two side pockets and a tie-up pattern at the waist. Team it with a casual top or a t-shirt to complete the look.